This extraordinary Indian Wars era flank marker was made for the U.S. 2nd Infantry Regiment, which has served the United States for more than two hundred years. The 2nd Infantry Regiment is the third oldest regiment in the U.S. Army, with history dating to 1791 and an active lineage that extends to 1808. Its engagements include the War of 1812, the Mexican War, the Civil War, the Indian Wars, the Spanish American War, the Philippine Insurrection, World War II, the Vietnam War, Kosovo and Operations Enduring Freedom and Iraqi Freedom. During the period where this flag was in use, the unit served in the Washington, Oregon and Idaho Territories (1877-1886) and then moved to Fort Omaha, Nebraska in 1886, remaining in the western plains until 1898.This silk flank marker of 38 stars would have been carried by the soldier on the ends or flanks of the unit when maneuvering in formation. Its stars and unit designator are expertly embroidered using silk thread. The flag's hoist is a sleeve hoist made from the canton and stripes. This was often done on military flags, and is a trait also seen on small Union Camp Colors from the Civil War period. Regulation military flags from the 19th Century are both rare and historically fascinating. They are rare because, unlike commercially manufactured flags, flags ordered for the military and produced under U.S. Government contract were produced in very limited quantities, and, in the case of flags such as this, were even customized for a particular military unit. These factors, and the fact that they were typically carried in the field and therefore subjected to the elements which would cause them to become worn and unserviceable, means that very few have survived. They are historically fascinating, especially when they can be definitively associated to a particular unit, because it's then possible to research and learn the historical particulars of the actual unit that carried the flag. At one time, most likely many years ago, this flag was framed for presentation before the introduction of UV protective glass. The flag was exposed to direct sunlight for a prolonged period of time, which faded the silk on the obverse, though the reverse remains its original vibrant blue and red coloration. The fading is simply a part of the history of the flag, and in my opinion, makes it no less desirable, and certainly no less rare. 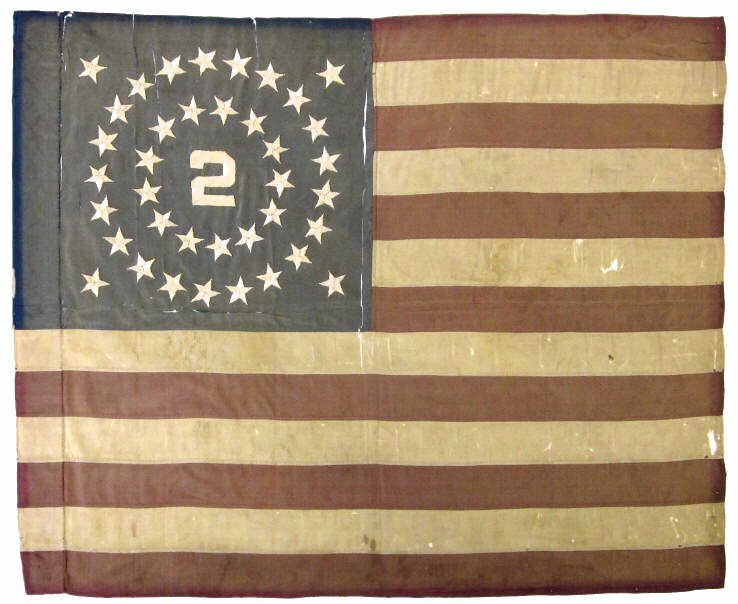 It remains a beautiful, historic flag that saw service with one of America's most storied military units, from the Battle of New Orleans in 1815, to Bull Run and Gettysburg, to the breakout of Normandy as part of Patton's 3rd Army, to Kandahar Province, Afghanistan.